Jane Shellenbarger was born in Detroit, Michigan. She was a CORE student at Penland School of Crafts in Penland, North Carolina from 1987-1989. Jane received her B.F.A. degree from the Kansas City Art Institute, and her M.F.A. from Southern Illinois University Edwardsville. Following graduate school, she worked as a resident artist at the Archie Bray Foundation for the Ceramic Arts in Helena, MT, 1996-97. She established her studio pottery, Mill Station Pottery, in rural Hale, Michigan in 1997. She has held teaching positions at multiple academic institutions, Kansas City Art Institute and Northern Michigan University and currently, she is an Assistant Professor in The School for American Crafts at Rochester Institute of Technology. She has taught at many craft schools around the country, among them, Penland School of Crafts, Arrowmont School of Crafts, and Haystack Mountain School of Crafts. Shellenbarger has exhibited her work in several prominent galleries around the country including: Leslie Ferrin Gallery, Lacoste Gallery, Lill Street, AKAR Gallery, Santa Fe Clay, Philadelphia Clay Studio, Red Lodge Clay Center and Baltimore Clayworks. Her work is also in the public collections of the Renwick Gallery of the National Museum of American Art, Smithsonian Institution, Washington D.C., San Angelo Museum of Fine Art, University of Arkansas, Fayetteville, AR, The Archie Bray Foundation for the Ceramic Arts, and The University Museum, Southern Illinois University at Edwardsville. Jane recently bought a house and studio in rural western New York. She is anxious to build some atmospheric kilns and establish a new studio pottery on Buck Run Creek. My work focuses on a pottery idiom, often incorporating historical references and images with domestic objects. I work in both porcelain and black clays, firing with atmospheric kilns. The pieces undergo multiple post firings to achieve a depth of surface. 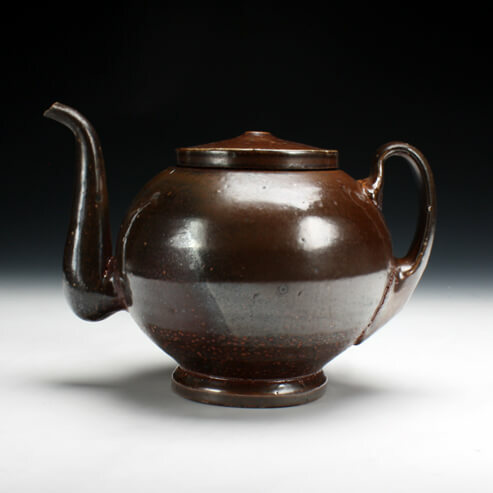 While function continues to be an essential concern, I am most intrigued with the ability of pots to transcend themselves as objects and convey information. The ability for the work to draw relationships to history and culture through form and surface content holds my fascination. At its best the work becomes both artifact and object of the contemporary world. The use of glaze as a painterly ground provides terrain to interact with imagery and or form that results in a fertile ground for endless investigation. Pots are intimate by nature. The history of ceramic objects to commemorate and document our culture is rich. As pots intersect with utility they have the ability to choreograph domestic experience affecting people in a deep and interactive way. There is a need to keep these interactions vital. The rhythm of making pots is, for me, an endless pursuit to express ideas and define interaction through form. While the influence for surface and form originate from Islamic history, the vessel is a metaphor and the imagery is based on the fable incorporating animal imagery to emulate the human condition. These instincts teach us as humans to remember and engage, even in the digital age, in the fact that we can tap into our primal selves. While the images may seem domestic they are bridges to represent human relationships. They remind us constantly of the back and forth of social and political hierarchy and its impact on our lives. Animals are a perfect metaphor as they encounter daily their instinctual reactions to love, the hunt and their physical and mental well-being. These are primal instincts we all share, and when witnessed …..they are universal.